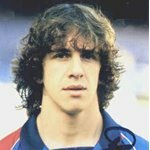 Carles Puyol Saforcada (born April 13, 1978 in La Pobla de Segur, Lleida) is a Spanish footballer who is the current captain of FC Barcelona. He has established himself as one of the best defenders in Spain and is a regular in the Spanish national team. He is set to be the Spainsh team's corner-stone at the World Cup Finals, and will be marshalling the likes of Raul, Torres and Reyes to make sure they do their fair share of the tackling! Carles Puyol Puyol is a tough, aggressive defender who has the versatility to play both as a full-back and in the centre. His whole-hearted approach makes him a favourite at his club side, Barcelona. Puyol is a vital member of Rijkaard's team and his tactical ability and know-how also means he is not a man to pick up many yellow cards or, indeed, injuries, both of which factors have meant that he is an ever present in both Europe and domestic competition. Puyol played for Spain at the 2000 Olympics, 2002 World Cup and Euro 2004 and has been capped over 30 times. His attacking mentality is a result of his playing as a striker in the early years in his boyhood club La Pobla de Segur, after injury problems with his shoulders forced him from his original position of goalkeeper. He has also played for the Catalan football team in one unofficial friendly. He went to Barca B at age 17 in 1996 and in 1999 Coach Louis Van Gaal put him into the first team and his debut came on 2 November 1999 against Valladolid, a game FC Barcelona won 0-2. He started as a regular for Barcelona in the right back position but has very successfully converted to center-back and is now regarded as one of the top center-backs in the world. He was first chosen as the captain for Barcelona in the 2003-04 season. In the absence of Raúl due to injury, Puyol has also been called upon to captain the Spanish national team.